Most Polynesian archipelagoes have a volcanic ‘hot spot’ origin and, due to tectonic plate movement, islands increase in age as one progresses further from the hot spot of volcanic activity. 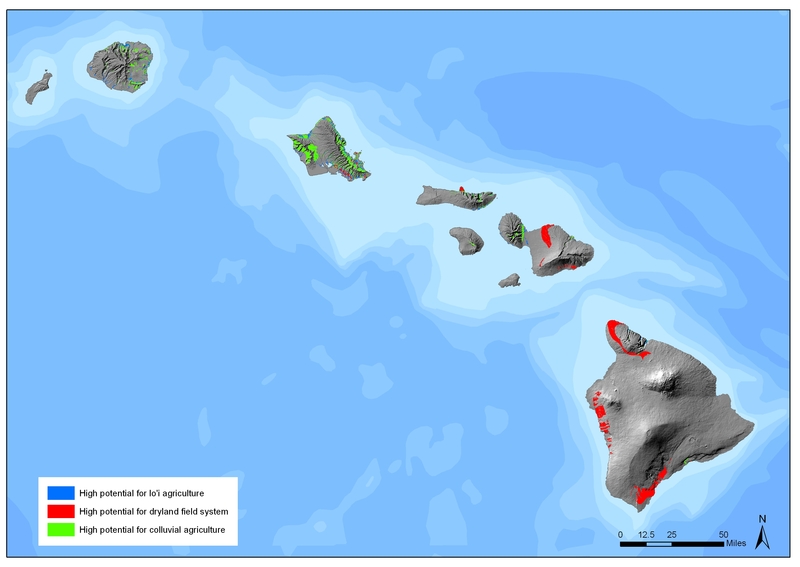 The Hawaiian Islands illustrate this geological age progression, and associated opportunities for crop production. 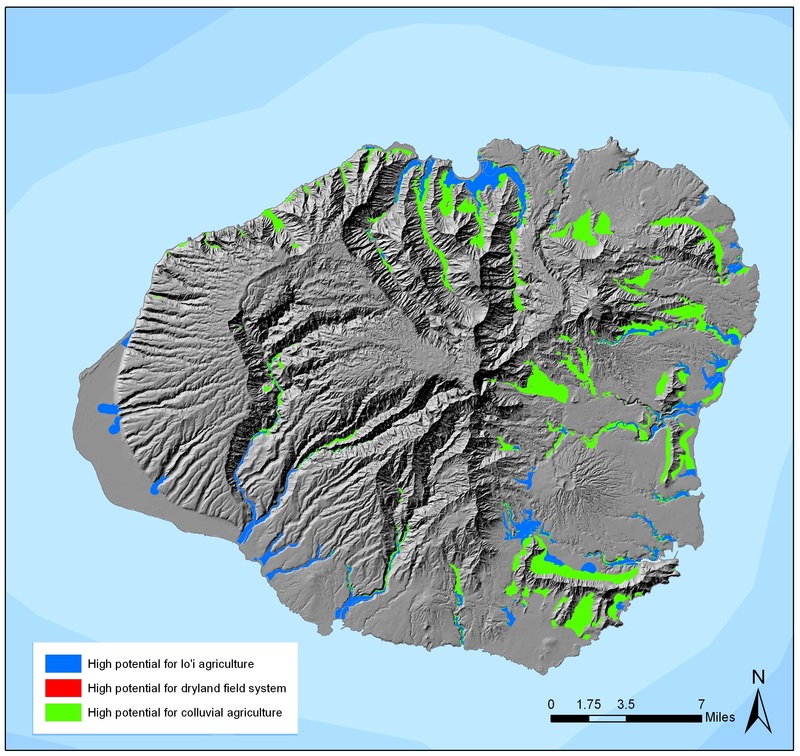 The geographically older westerly islands (Kauai, O‘ahu, Molokai and west Maui) are more heavily weathered, with permanent stream flow and alluvium valleys, on which irrigation could be developed. The agricultural emphasis was on taro irrigation, with shifting cultivation and other forms of dryland gardening providing a secondary role. 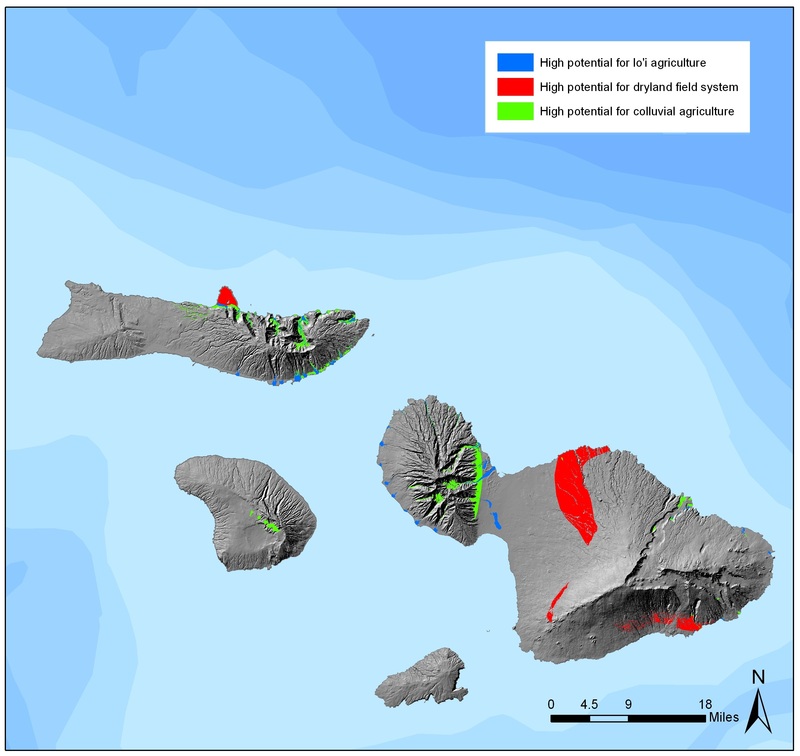 In the geologically younger islands to the east (east Maui and Hawai‘i), irrigation was only a minor contributor to subsistence production and highly labor-intensive, short-fallow dryland field systems predominated. Most of the arable terrain is volcanically younger, lacking stream flow and prohibited the development of extensive irrigation works. 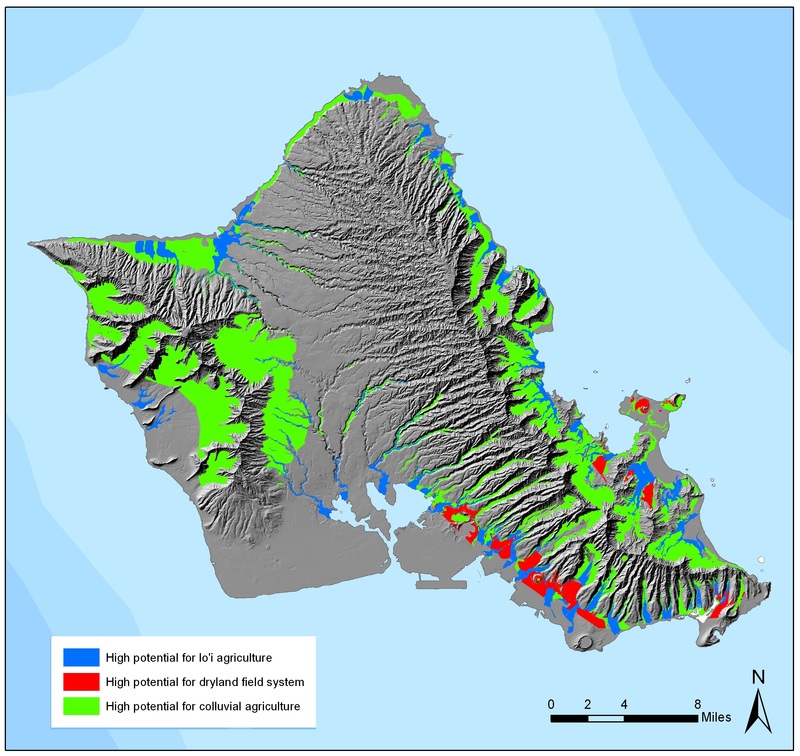 Thus, irrigation systems in east Maui and Hawai‘i, while present in restricted areas, contributed in only minor. Later, there was a major expansion into leeward regions throughout the archipelago. 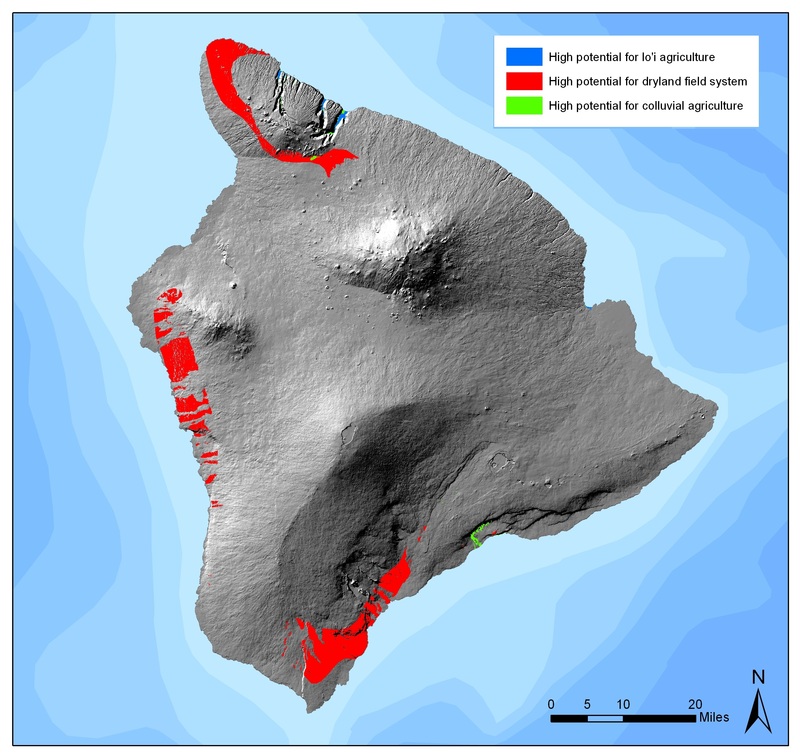 The initial stages of this expansion focused on leeward valleys or around bays with rich marine resources. By about AD 1400, settlements were moving into increasingly marginal environments, including the interiors of leeward valleys and the higher elevation slopes of the easterly islands. It was a period of tremendous significance in Hawaiian history; during this time, (1) the population underwent a geometric rate of increase; (2) virtually all habitable and arable lands were occupied and territorially claimed; and (3) the territorial pattern of chiefdom (moku) and sub-chiefdom units (ahupua‘a) appears to have been established. There were other differences in the political and religious structure of the eastern and western chiefdoms. In particular, the elaborate makahiki, or wet-season harvest ritual, as well as the emphasis accorded the cult of the war god Kū with its associated luakini temple ritual, was especially developed on Hawai‘i and Maui, less so on the westerly islands of O‘ahu and Kauai. Of the four great Hawaiian gods (Lono, Kāne, Kanaloa and Kū,) Lono and Kane were both associated with agriculture, each showing different symbolic linkages, the one centered on Lono involving rainfall, sweet potato (and to a lesser extent dryland taro) and dryland cultivation, the other centered on Kāne involving flowing waters, taro and irrigation. Lono was specifically the god of dryland cultivation and associated with “clouds bearing rain,” thunder, the sweet potato (the primary dryland crop,) the rise of Pleiades and the rainy season. Kāne who was associated with pondfield irrigation of taro, running water (wai,) springs, fishponds, male procreative powers and irrigation. As noted by Handy & Pukui, “the family bowl of poi (starch staple made from taro) in the household was sacred to Haloa, who is Kāne, an ancestor in the line senior to man”. The political formations and moves for territorial expansion just before ‘contact,’ show a pattern that corresponds closely to the fundamental differences in agricultural base. The aggressive, expansionist, Ku-cult centered chieftainships of Maui and Hawai‘i were precisely those polities most dependent upon intensified dryland field cultivation. The frequent objects of their aggression were the western islands of Molokai, O‘ahu and Kauai, and their resource-rich centers of irrigation agriculture and fishpond aquaculture. In these western islands, the possibilities for greater agricultural intensification remained substantial, despite high levels of population density, owing to the environmental conditions favoring irrigation. The complex linkages between varied agricultural landscapes and the social relations of production – effectively, the ecological and cultural contrasts between ‘the wet and the dry’ – illustrate the role intensification played in the political evolution of chiefdom societies.